I’ve been knitting. To be precise, I’ve been knitting the same 22 rows for 2 days now. I am starting to feel like that woman who slowly goes mad in the short story “The Yellow Wallpaper” as she covers the same ground over and over again. The yarn arrived. All of it. Could it be any less nautical in theme? I started the sweater. It’s a three color sweater. The main color and two contrast colors to make up the stripes. It takes 22 rows of knitting before I get a good look at how the colors are working. After the twenty-two rows I ripped it all out. I didn’t like the way the colors looked together. I gathered the yarns, moved them around, came up with another combination. I started the sweater again. Twenty-two rows and I ripped it all out. I didn’t like the way the colors looked together. I gathered the yarns for another group session and came up with another combination of colors. I started the sweater again. Twenty-two rows and I ripped it all out. I didn’t like the way the colors looked together. I gathered the yarns, the group session was a little tense this time, but I came up with another way of mixing the colors. I started the sweater again. Twenty-two rows later…. Yes, I could have a finished sweater by now if not for the ripping. When these “snags” happens not only do I have to attend to my own growing frustration, I need to keep The Skipper calm too. He hates when I knit and rip. Each time I rip a piece of knitting the hair on his head stands up and his jaws tighten. I was into the fourth straight hour of knitting and ripping when he said, “Do you have to do that?” At the time, neither of us knew I’d be knitting and ripping for two entire nights. I find great solace in not being able to foresee the future because often the present is just about all I can handle. Yarn Rascal, on the other hand, made every ripping session a winning situation for himself. He sat patiently on the floor watching until the ripping was done. When the entire 22 rows of yarn lay in my lap, up he’d come pretending he wanted to be loved, all the while rooting around in the yarn, some of which just happened to find its way into his mouth. The final group session with the yarns was held last night. Staring at them, wondering how they wanted to go together that would be pleasing to me and to them, my brain said, “Think fresh.” Fresh? When I think fresh I think of bright fruity colors, the only ones that came anywhere near that was the orange (it said it was russet but it clearly is orange) and the light green that when put next to the orange makes my eyes want to pop out of my head. 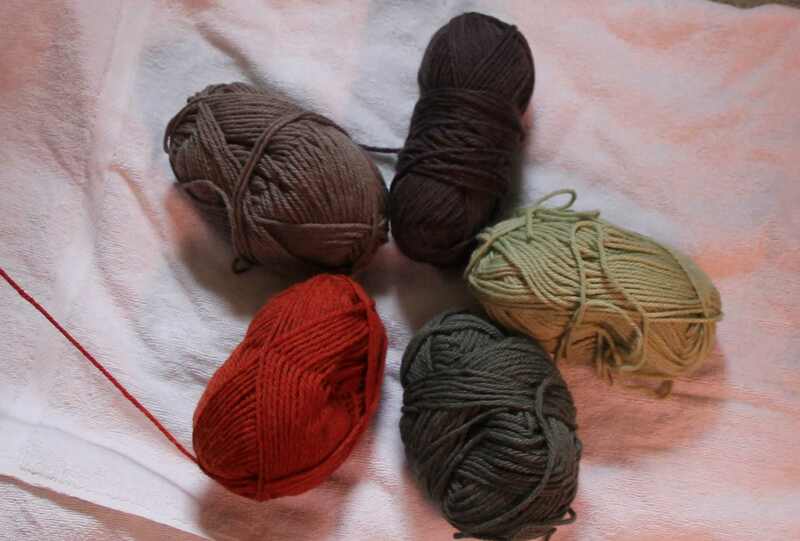 That left me with dark brown, dark green, and light brown. I eyed the light brown. My brain said, “It’s the color bananas turn when they’re ripening.” Does that qualify it as a fruity color? I hope so. I really want to get past 22 rows.